Despite a lacking story and some moments that fall flat, Dead Space 3 is just too much fun to ignore, and anybody looking for infinitely replayable gameplay should get their hands on it. Truly good horror-themed games are few and far between these days, especially since audiences have grown increasingly fearless of whatever ideas developers can throw their way. To this day, only a handful of games stand out as eternally terrifying: Resident Evil 4, Amnesia, and the Dead Space series. 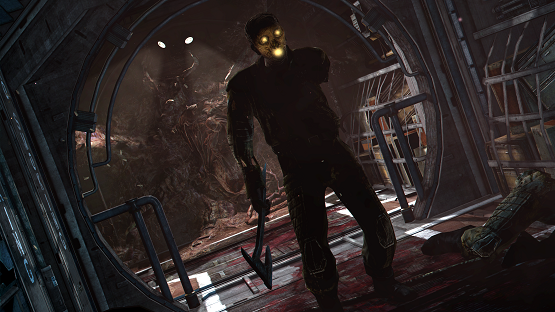 Isaac Clarke’s quest for survival aboard the USG Ishimura is hands down one of the scariest games released for the current generation of consoles, paving the way for a sequel that improved on the original in every way. But now we’ve reached the third entry, the end of the trilogy, the long-awaited Dead Space 3. With the newest iteration of the lauded series comes a plethora of changes to the tried and true formula, the most noticeable and touted feature being the addition of co-op. Fans were skeptical of the decisions made to add a mainstream appeal to the series, including myself. But does the final product live up to the illustrious Dead Space name? The answer to that question is a complicated one, but I can easily say without a doubt that Dead Space 3 is an amazing achievement in the action genre, even if it dials back the horror a bit too much. Although the first two entries sat firmly on the fringes of survival horror, any pretense of this is gone, replaced with intense set pieces, repetitive jump scares and copious amounts of health and ammo. The Unitologists have formed an army intent on overthrowing the government and activating Markers across the universe, unleashing a Necromorph attack on human colonies. Isaac Clarke is called to the isolated, frozen landscape of Tau Volantis, a planet on which a group of soldiers was able to hold off a similar attack. Hoping to find the secret to stopping the Unitologists for good (and find ex-girlfriend Ellie in the process), Isaac embarks on yet another adventure in hopes of saving mankind once again. As much as some fans will decry the decision, the fact that Visceral Games took the fight to the Necromorphs this time around was for the best. The combat that we have all come to know and love is still perfectly intact, with a few tweaks that serve to only enhance the experience. Gunshots still blow holes in the Necromorphs, every punch and stomp packs perfect crunches and blood spatters, and kinesis and stasis modules still add variety to each and every battle. This time around, however, Isaac is much more mobile, gaining the ability to crouch, take cover, and roll away from baddies. This also marks the first appearance of human enemies in the series, and this is one of the new decisions that doesn’t fare so well. The Unitologist soldiers are downright stupid throughout the game, basically charging right into Isaac’s gunfire. Taking cover isn’t exactly smooth either, but the humans are so nonthreatening that it’s hardly essential. 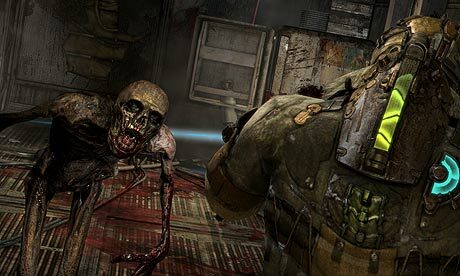 In fact, even the Necromorphs seem to have been dumbed down plenty for Dead Space 3. The stalkers, who made life miserable on the Sprawl, don’t even bother trying to ambush you. Rather, they charge right at you with no plan, taking some of the bite out of fights. Many of the new additions to the formula serve to raise the bar for the action, and almost all of them are perfectly executed. Upgrades are now done both via the bench and the suit kiosks, with the bench now offering the option to craft weapons out of looted scrap material. This was a feature that was played with in the demo version, and despite my initial hesitation, it turns out that creating your own guns is insanely fun. The options are limitless, with some of my favorites including an assault rifle with a shotgun attached to the bottom and a javelin launcher with a force gun underneath. As such, the mechanic gives players the chance to play to a style that suits them best. Looting scrap materials throughout the game is a feature that I didn’t expect to love so much, but it became a full-blown addiction after only a few minutes. These materials are then used to craft new guns, items, RIG upgrades or attachments for the guns. It sounds daunting at first, but by the first hour you’ll be working the bench like a master. 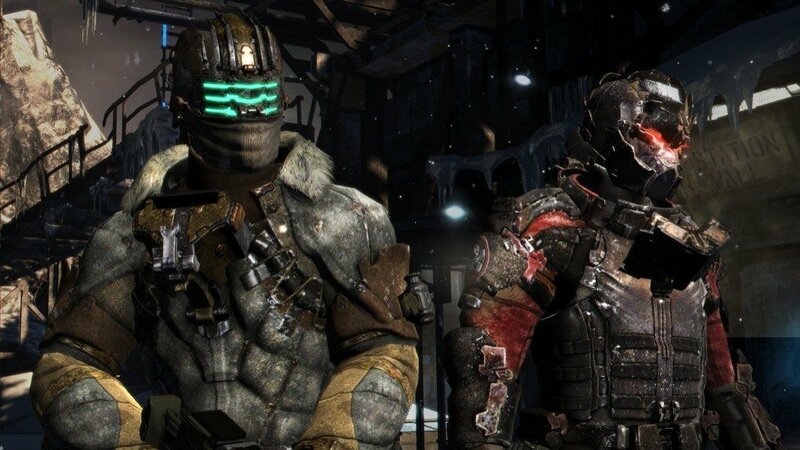 The conflict between using your resources to create more health packs, upgrading a gun or adding to your defense adds a new layer of resource management to Dead Space 3. Despite this, the amount of items that enemies drop can outweigh any need to create them, taking away from this new system. My first playthrough was on medium difficulty, but anybody who has played a shooter in the past decade could easily tackle hard mode. Multiple New Game+ modes become available after your first victory, adding to the replay factor infinitely. Minutes after the credits rolled, I was rushing to start over and gather up any collectibles I missed my first time through. Each chapter is rife with artifacts, weapons blueprints, and other collectibles that add details to the vague story. As any fans of the first two games can tell you, the atmospheres are absolutely gorgeous and lush, and now that Isaac has escaped the confines of ship after ship, Dead Space 3 boasts the most impressive setting of the series. Tau Volantis is stunningly beautiful, with high winds and furious blizzards blowing organically across the landscape. Even in the bright light of day, a creepy vibe is present on the surface, proving that the series can move out of the stuffy interiors it’s used to and really flourish. These larger environments lead to the option for exploration, something that was sorely missing from previous entries in the series. While exploring the planet, optional side missions become available, leading to some insanely fun moments and memorable scenarios, while also providing plenty of upgrades and items as rewards. It already takes around 15-20 hours to complete the lengthy campaign, and the side missions easily raise it about 25+ hours. That being said, the last few chapters of Dead Space 3 start to drag on, with many moments feeling padded to add to the time. As with the games that came before it, backtracking is a huge issue, with Isaac’s engineering background serving to make him the errand boy. You’ll hoof it there and back again multiple times, which becomes frustrating when it breaks up the flow of the plot. Sadly, even the story falls apart towards the end, with weak characterizations and odd plot points collapsing closer to the finale. The addition of a co-op mode is the largest change that has been made, and its implementation is flawless. A larger focus on action makes it easier to adjust to having a partner, but us loners who don’t play well with others aren’t missing out by playing alone. When playing with a partner, certain scenarios are tweaked slightly to adjust for the extra pair of hands. A solo go through feels completely natural and never makes it seem like players are missing out on anything. Some side missions are co-op only, however, giving you incentive to play through with a buddy just to gather more collectibles. Partners will be playing as John Carver, a soldier with a troubled past that is revealed in much detail in the co-op run through. Choosing to play alone means you miss out on hearing about his life, but unless you’re dying to know everything about Carver, you’ll never notice the omission. Visceral Games should be applauded for integrating co-op so well into Dead Space 3, making both solo and co-op insanely fun experiences. Visceral and EA Studios have put together one of the most polished packages on the market currently, and it’s a game that fans of the series shouldn’t miss. The changed focus may throw you off the usual horror avenues that Dead Space is used to, but the evolved gameplay is compelling enough to carry the weight on its shoulders. Despite a lacking story and some moments that fall flat, Dead Space 3 is just too much fun to ignore, and anybody looking for infinitely replayable gameplay should get their hands on it. This is a rare case where the missteps of one section are easily made up for elsewhere in the game. Dead Space 3 is an expansive package that will give all fans of the series something to love. It might not be the best game in the series, but it’s easily the most experimental, and almost every chance it takes pays off wonderfully. Step back into the RIG one more time, and Dead Space 3 won’t disappoint you.